Before an excavation can take place many surveys must be undertaken, such as remote sensing techniques, to analyze the likelihood of the site containing something of historical interest. By excavating a piece of land a great deal can be found out about the past that simply can't be found out using aerial reconnaissance, magnetic survey methods or other such techniques. It is important to understand that excavation isn't undertaken lightly. A site will be studied for many months before hand using a wide range of methods from field walking to electromagnetic methods. 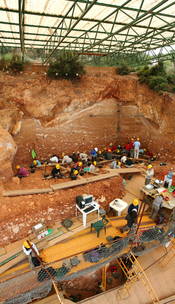 The techniques used before the decision to excavate is taken can be viewed as checks and balances against reckless excavation, done without in-depth research which could scar the land. As a result the chances of an inappropriate excavation are vastly reduced. There are predominantly three main reasons as to why excavations take place, which help argue the validity of excavations. These are Research excavations, Social excavations and Rescue excavations. WriteWork contributors. "Excavation is destruction." Explore with examples a range of justifications given for excavating sites." WriteWork.com. WriteWork.com, 17 November, 2004. Web. 26 Apr. 2019.